Preschool handwriting is often a controversial topic, as many people (including myself) believe young children should not be spending too much time working at a desk, and should not be sitting down to write on paper until at least Kindergarten. However, it is never too early to start preparing for handwriting, as the preschool years are the perfect time to lay down good foundations for later school skills. Here are some really important pre-writing activities you can do with your preschool child (and I explain why each is important for helping handwriting skills). Try and include one or two of these activities in your preschooler’s daily life to ensure they have a good start in their pre-writing skills! 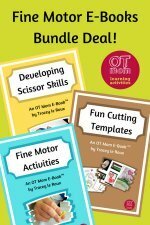 How do I help a child with poor fine motor skills to still get pre-writing practice? What about actual preschool handwriting? 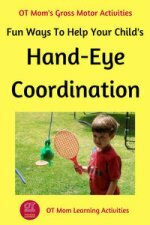 Eye-hand coordination is an important foundation for good handwriting. These skills will help your child to trace the patterns and letters used in pre-writing lessons. Good eye hand coordination will also help your child to color in the lines, and later to write within the lines. 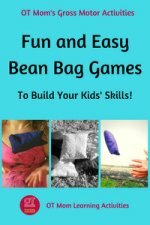 Preschoolers get frustrated at chasing errant balls – so put one in a recycled net bag where it can be hit, pushed, and caught without rolling away. Take a few minutes each day to encourage your child to use the ball in the net. What child doesn’t love bubbles? Blow some and let your child try and pop them. Just watch that the soap does not get into little eyes. Threading beads and pushing a shoelace through a lacing card are good eye-hand coordination activities for preschool children. You can make your own lacing cards by punching holes in thick card or thin plastic (the side of a plastic milk carton is great for this). Although I don’t recommend too many desktop activities for preschoolers, my children did enjoy doing simple mazes, follow-the-path activities and overlapping lines when they were at preschool age. 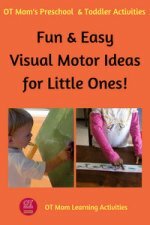 If you are looking for simple eye-hand visual motor worksheets like this one, check out my review of a great visual motor workbook here. To make the most out of each worksheet, I had my kids go over each path several times, with a different color each time, and gave a star to the color that stayed in the path the best! Good visual perceptual skills will help your child distinguish between letters, and will help them when learning the correct letter formations. This is an important part of preschool handwriting. I cover visual perception quite extensively elsewhere on my site, so pop over and view a whole range of visual perception activities that are easy to implement using regular household objects. Form Constancy Activities will help your child remember that a letter or number is still the same, no matter where it is seen or what the font is. Visual Closure Activities will help your child learn to recognize numbers and letters even when they are smudged or partially covered. Figure-Ground Perception Activities will help your child develop the skills they need to find information on a busy board, read a map or use a dictionary. Visual Memory Activities will help your child with phonics and help them to learn sight words. 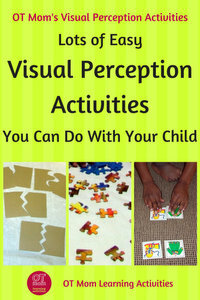 You can also view a range of really awesome preschool visual perception resources over at PFOT. Develop your preschooler’s hand strength and dexterity to get those little hands ready and primed to control a pencil and write neatly! Even if your child already knows how to hold and use a crayon fairly well, you still need to provide lots of opportunities for those little fingers to get stronger and more mobile. 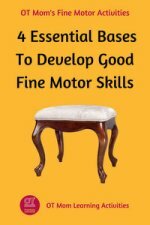 There are 4 essential bases to developing fine motor skills and none of them involve drawing and coloring at preschool level! 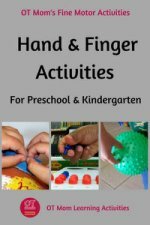 Simple hand and finger activities should form an essential part of every preschool handwriting preparation program. 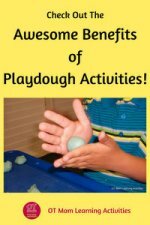 Playdough Activities - don't just give your child a blob of dough and leave them to play with cookie cutters - show your child some specific techniques that will strengthen little hands and fingers as well as work on some coordination skills. 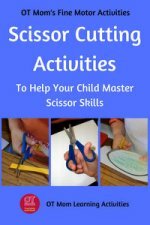 Scissor Cutting Activities - cutting with scissors is a wonderful way to strengthen little hands. 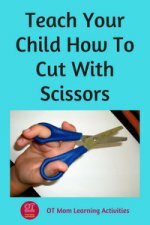 If the child holds the scissors correctly, it will also help the tripod fingers (the fingers that hold the pencil) to learn to work together well. I don't think preschoolers can ever do too much scissor cutting! Check out these pages on my site for all the activities! Visual-motor integration activities will help your preschool child to develop the skills needed for correctly perceiving and then copying shapes numbers and letters. However, preschool handwriting lessons should include lots and LOTS of practice in tracing and copying simple shapes before any number or letter formations are attempted. Many preschools introduce just one shape a week. Start with circles then progress to squares and rectangles, then to triangles and diagonal lines. Lastly teach intersecting lines (upright cross, diagonal cross). Use a large surface (such as a blackboard, outside wall, sandpit) and draw a simple shape. Have your child trace over the shape a few times. Give your child lots of opportunities to trace the shape in different mediums. Use bath crayons in the bath, shaving cream on the tiles, sidewalk chalk outdoors, or sand. In this way, kids who struggle to use a pencil or a crayon can use their fingers or a small sponge to trace over your shape and get satisfaction in this way. If your child has been practicing cutting, a nice idea is to cut out simple shapes, paste them on a background and then trace around them as shown above. Remember, first give lots of practice tracing and then let your child try drawing the shape on his/her own. For ideas for working on diagonals (using lazy 8's) as well as other visual-motor integration activities, pop over to this page on my site. I have often worked with children who have very poor fine motor skills and who therefore hate working with crayons and pencils, and the parents are often worried about their child falling behind in learning basic pre-writing skills while I am working on the fine motor delays. The trick is to realize that preschool handwriting is all about mastering the shapes, diagonals and intersecting lines that will lead to later letter formation. So all the parents need to do is to give their child lots of opportunity to practice those skills using other ways! If you can draw the shape and have the child trace it with their fingers, that would be wonderful for a child who struggles to manipulate a tool. You can do this on a blackboard or outside wall with chalk, with shaving cream in the shower, with sand on a tray. You can also use little cloths or sponges: have your child use a wet sponge and then a dry sponge to trace along a chalk outline, or a dry sponge/cloth to trace along a path made by a whiteboard marker. I am personally a big fan of the "Better Late Than Early" school of thought, and have the awesome privilege of being able to implement this as a homeschooling mom, to the great advantage of my children. However, many parents don’t have the privilege of homeschooling and need to figure out how to help their preschooler write when the pressure is on from an accelerated preschool program or advanced peers. 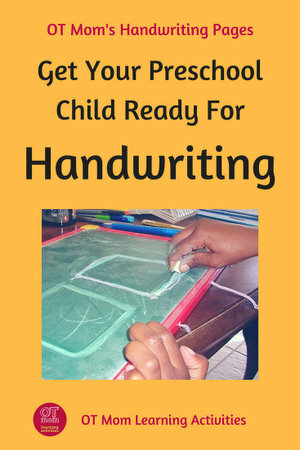 Implement the ideas on this page to develop the essential foundations for preschool handwriting. If your child is learning to write his/her name, try and keep it “big” – blackboards, sidewalk chalks, sandpits - to avoid your child hunching up over a piece of paper before the fine motor skills are ready. 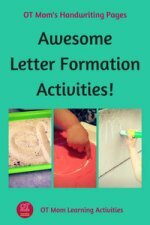 Try my letter formation activities! And make sure the correct letter formations are used from the start - check out my page of letter formation tips. It is very, very hard to unlearn poor letter formations! If your child must learn to write his or her name, make sure the formations are correct. It saves a lot of handwriting headaches later. Ask your child's teacher for help if you are unsure of how your child should be forming letters or check out Handwriting Heroes for their awesome way of teaching correct letter formations! If you want to "dig deeper" into any of the topics raised on this page about preschool handwriting, here are links to more in-depth pages on my site. I hope this page on preschool handwriting has been helpful to you and has inspired you to build solid foundations for your child’s school career! Why not sign up for my free, occasional newsletter to keep in touch with new pages and ideas on my site?